Radioactive Man welcomes guest artist Frank Brunner (Doctor Strange) for a twisted and tyrannical trans-dimensional tale! 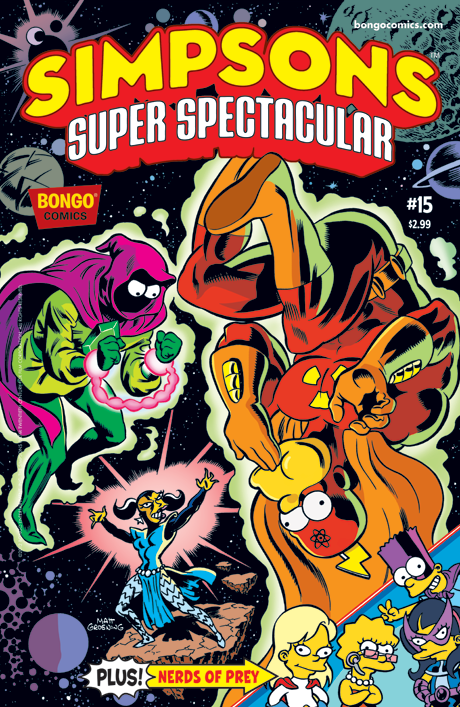 When Radioactive Man’s fellow Superior Squad member Plasmo the Mystic goes missing, the Irradiated Crusader must travel across time and space to rescue the supernatural spellcaster. Then, a new, all-girl, superhero team, The Nerds of Prey (Jessica Lovejoy, Sherri and Terri, and Greta Wolfcastle), spring into action under the watchful eye and technological savvy of a secretive Lisa Simpson with one goal in mind–– rescuing Bartman from the clutches of the Cat Lady Woman. Enhanced with a spectacular cover by Hilary Barta.